Unicycle Rose: WARNING; 4.0 to 6.0 earthquake is likely in Southern California March 24-26!! WARNING; 4.0 to 6.0 earthquake is likely in Southern California March 24-26!! This gorgeous mountain is what you see when you look out our front window. Residing here for eleven years, it has been a favorite part of my home and I consider it my mountain. If I glance over my shoulder while typing this, what do I see? That mammoth rocky mountain that never moves. Well, it is not supposed to. With the way earthquakes have been rocking our globe lately, I can’t help but think my mountain may do a shimmy soon. This reality scares me. 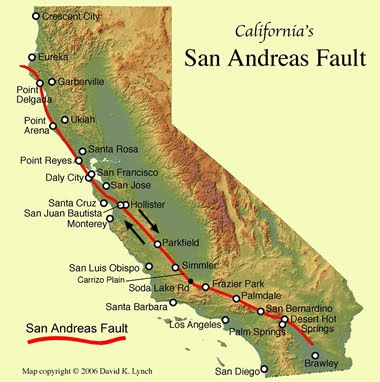 Growing up in Southern California, I have come to acknowledge that earthquakes are part of life here, just like sandy beaches, Disneyland and Hollywood. I hate this rockin’ part of our state. I always have. However, I realize that whether it is cyclones, blizzards, tornados, tsunamis, floods or volcanoes, anywhere you live there is some natural curse that comes with the territory. The thing I hate about earthquakes is that there is no warning. Zip. Nada. I googled California earthquake prediction and found this: WARNING; 4.0 to 6.0 earthquake is likely in Southern California March 24-26 (Visit http://www.quakeprediction.com/ to see for yourself). Quakes freak me out! Out of nowhere there is loud rumbling, then the lights sway, the floor rolls. I panic and duck for cover as I shiver with fear. A big quake I remember shook at 6AM, February 1971, and was centered in the San Fernando Valley (Sylmar), where we were living at the time. It registered a 6.6 magnitude and made the sidewalk in front of our house buckle! All the crystal and glass chachka flew off the shelves and my sister, Miss Piggy, and I carefully picked the broken glass pieces out of our shag green carpet. After the 6.7 magnitude Northridge quake of 1997, I swore I’d leave this state. However, I am still here and although it’s terrifying to be jolted, I try to be prepared. How do I prepare? When I go to the market I pick up an extra gallon of water. Oatmeal, oil and canned goods are bought a bit at a time too. I did research on what basic items we would need (listed below) and see cheese cloth is the only item I am missing. Californians, it is not a matter of if, but when, the Big One is going to jiggle my big beautiful mountain and my nerves. I hope I am prepared, are you? • Ax - weighing at least 6 lbs.